Rippedsheets.com offers a variety of different anti-microbial label and tag options. These can be diecut to any shape or size. 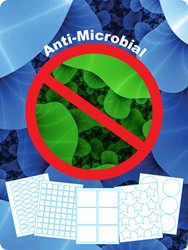 With the demand for anti-microbial labels growing, Rippedsheets.com is working to offer a wide variety of options. The options are not limited to labels, but anti-microbial tags and wristbands are available as well. With a proprietary topcoat, Rippedsheets.com is able to convert many of their materials into anti-microbial labels. The materials range from a plain white paper to a brushed silver label. Some of the tags and wristbands can also be converted into anti-microbial. This special coating can make the product greener and fresher by inhibiting the growth of microbes, odor-causing bacteria, mold, mildew and fungi on the product’s surface. Testing showed that this antimicrobial technology is 99% effective in eliminating the growth of bacteria like E-coli and Staphylococcus aureus. Testing was executed in accordance with JIS Z 2801. Anti-microbial labels are becoming more and more popular in clean rooms, pharmaceuticals, cosmetics, schools, hospitals, and nurseries. The anti-microbial wristbands are perfect for hospital wristbands. These wristbands are not only anti-microbial but tear-proof and waterproof as well. The labels and tags can be diecut to any shape or size, as well as custom printed. The wristbands come in adult sizes and kid sizes. Contact the customer service specialists at 1-888-791-9590 for any application that needs protection against the spread of bacteria.